Liverpool's owners have been told that the fight to make football affordable for fans will go on despite the club's surprise reversal on ticket prices. 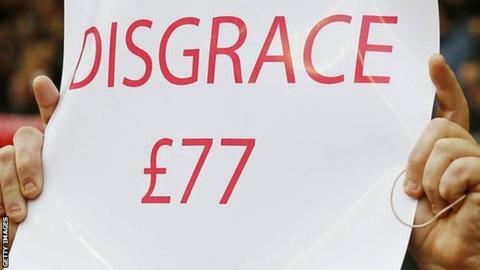 On Wednesday, the Fenway Sports Group scrapped its planned top-price £77 ticket and apologised for the "distress caused" by last week's announcement. But fans' group Spion Kop 1906 told the BBC that the battle may have been won but the "longer war isn't over". Liverpool's dearest matchday ticket will now stay at £59. Thousands of Reds fans protested against the planned price hike by leaving Saturday's home game with Sunderland before it had ended. They started to walk out on 77 minutes, with their team leading 2-0. Sunderland eventually fought back to secure a point. James Cooke, a member of Spion Kop 1906, told BBC Radio 5 live that he was "pleasantly surprised" by the club's decision. "There's a feeling amongst football supporters that we were fighting a good fight but it was always falling on deaf ears," he said. "We had 13 months of consultation with the club, repeatedly telling them their plans would go against what fans wanted, but they didn't listen." Cooke said that the club needed to start taking fans more seriously. "While we welcome the news, the next process is dialogue with the club to ensure that, for future generations, football at Liverpool and across England is affordable for everyone," he said. Cooke also said all fans should unite to make football affordable. "Football rivalries have to go to one side," he said. "If supporters' groups join together, that's how we can really get some results." The Spirit of Shankly, another fans' group, also welcomed the club's decision to abandon the price hike. But, in a joint statement with Spion Kop 1906, said it was "not our panacea", adding: "More must be done to make football affordable." Local MP Alison McGovern, who represents Labour in Wirral South, hoped the club had learned a lesson. "For the sake of a marginal amount of income, the owners had put at risk the relationship with the fans," she told BBC Radio 5 live. "I know lots of people who walked out who would never dream of leaving a game before the final whistle. "My family were there and they did. I know what an absolute wrench that was. They felt a line had been crossed and they wanted to be listened to. "I am hopeful that this signals a direction for football that it isn't a business like any other. People can't just switch. The role of owners is to be custodian of that relationship between fans and their club."